Google announced Enhanced Campaign for Adwords in February and while the change has been positioned as an upgrade to the existing Adwords system it has garnered a fair share of criticism from Adwords consultants, primarily because it takes away a lot of control that advertisers enjoy in the present Adwords system. However, recently Google has announced an extra level of control that is sure to bring some smile for the Adwords professionals. With the latest change, Google will allow Mobile bid adjustment at Adgroup level, enabling the advertisers to tighten up the adgroup bid adjustment. Google Adwords campaigns, enhanced or otherwise, allowed advertisers to control their budget at Campaign level and bids at Keyword level. Having an extra layer of bid adjustment at the Adgroup level would definitely be a welcome control feature for Adwords professionals. In Adwords Enhanced Campaigns, mobile bids are set up as a percentage of your general (Desktop bid). Now if there is a wide range in popularity and user behavior for your keywords in mobile compared to desk top, you will need much more precision and control over the bids. This ad group level bid adjustment is definitely going to come in handy for such advertisers. Google Adwords team is planning to roll out this feature in mid-May. 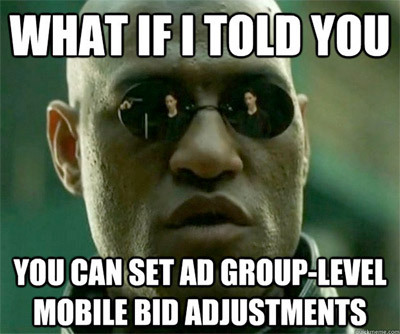 I think it is very useful to all the advertisers as it provides flexibility to have different mobile bids for different ad groups rather than a common mobile bid for whole campaign applicable across adgroups. Google team will automatically start upgrading all the Adwords campaigns to enhanced campaigns by 22nd July 2013. If you have not yet upgraded your campaigns to Enhanced campaign, it is time you start reading up more on this change and upgrade your campaigns. I am Kothapally Arun. I am an independent online marketer and a blogger at Ecommerce Yogi .